We would like to welcome Leah and Emily to Anderson's Bay School. Every year our teaching team undertake two professional development, teacher only days immediately before the start of the school year. Along with a number of other schools we organise a speaker of significance to support our professional learning. For 2019 we intend to do the same, however the speaker is limited to being able to attend on Thursday 31 January. The logical start date following this speaker will Monday 4th February. This date, however is taking the start of our school year later than we had hoped and we want to take advantage of the learning time this provides for our children. Therefore, Anderson's Bay School will be doing something a little different next year. Our start date for the 2019 school year will be Monday, 28th January, For the first time in many, many years we will take a teacher only day during term time on the Thursday 31st January, meaning school will be closed for that day. This is not our normal practice, as we genuinely do not want to inconvenience our families and normally will hold such days during term breaks, however, the calibre of the combined schools professional development opportunity is very important for our staff. We will continue to share this information, as we want our families to be completely well informed of this day, allowing you to make arrangements for your children. We have also arranged for Magic After School care to be running a "holiday style" programme on Thursday 31st January to assist our families with this day. This opportunity will be available for any of our Anderson's Bay School children. As many of you will be aware we begin to consider our next year class structures at this time of the year. As you will appreciate this can be a very lengthy process as we consider many aspects that influence classroom placement for your child. I would like to assure you all that a tremendous amount of consideration and thought goes into constructing classrooms that best meet the needs of our children and school. Unfortunately we are not able to meet parental requests for classroom placements based on aspects such as friendships or teacher preference, but need to make holistic decisions. However, if you feel that there are some extenuating circumstances that you would like us to be aware of when forming classes, please put this in writing and email classes@andybay.ac.nz before Friday 26 October. Please do note that these will be taken into consideration but will only be one element of the decision making process. The Otago Art Society Youth Awards were held on Friday, 21 September 2018. Many of our pupils entered their artwork into the Exhibition. Congratulations to Hannah Bloxham who was awarded 3rd place and Rama Balasmeh who was awarded 2nd place. There is some really great work on display. The Exhibition is on until the end of the first week of the holidays, in the first floor of the railway station. 'Cheese Making' activities, and 'Eating for Health'. Most people said their favourite part was patting the new born calves. Friday Sausages are coming back in Term 4! Please place the correct cash ($2 per sausage) in an envelope with your child’s full name, class number and number of sausages required and post in the slot in the office before 3pm on the Wednesday. Never have the correct change in your wallet? How about ordering for a block of weeks. Simply place the correct amount in an envelope with the details listed above and stating which dates you wish to order for. Ice blocks will once again be sold in Term 4 as part of our fundraising for Year 6 Camp. The first day for ice blocks will be Friday, 19th October and the last day, Friday, 16 November. An order form will be sent home with children this Friday. As you will be aware, there are ongoing concerns for the safety of all, as children are dropped off and picked up by their parents in cars, near the school gates on Jeffery Street, Highcliff Road and the Memorial Gates by the ‘Teachers Only’ parking area. Of particular concern are those who park on yellow lines and endanger themselves and others. Number plates will be relayed to the DCC traffic department and illegal parkers can expect communication from them. The safety of all children is paramount. This week has seen new signage appear around the main driveway to the school and along Jeffery Street . Anderson’s Bay School has a “No Dogs” rule which complies with health and safety regulations. The “No Dogs” policy is clearly stated on the various school gates and bringing dogs onto the school grounds is breaching the rule. While we sympathise with those who would like to bring their dogs to school; it is not permitted. The school has a quantity of school desks which are now available for sale. The desks are manufactured of varnished chipboard with powder coated metal legs. They have flip up tops with storage underneath, are well used and very sturdy. They are available for $2 each. IDEAL CHRISTMAS PRESENTS - ORDER NOW!!!! A sample can be viewed at the school office. Each kit costs $40, which is below retail price and excellent value. Always a favourite event for the kids, the PTA have set the date for the Kids Market! A great way to de-stash and make some money before Christmas, the kids can dig out any toys, bikes and ride-ons, games, books, clothing they want to sell on their own stall - as long as they are in a good saleable condition. The Kids Market is for the children to sell toys, games, clothing etc. with the support and help of their parents. A notice about stall bookings has been sent home with your child. Friday, 9 November 2018. A notice will be sent home closer to the date. Otago Fish & Game Council is running two FREE Take-a-kid-fishing days at the Southern Reservoir (located off Reservoir Road) on Sat 22nd and Sat 29th September 2018. Registrations for the event start on Monday 27th August and are essential. To register, visit https://fishandgame.org.nz/otago/freshwater-fishing-in-new-zealand/fishing-news-and-events/otago-take-a-kid-fishing-days-2018/ Alternatively, come into the Fish & Game office on the corner of Hanover & Harrow St, Dunedin. Registrations are limited to 130 kids per session. Spare fishing rods will be available along with experts to help kids get started. Parents or care givers must be present to supervise children. Mr Science and friends put on a WOW Show! Fun and Educational! Sensational science demonstrations on stage, audience participation, fun for all ages. Join us on a magical journey exploring the excitement of FLYING, FLOATING, GLIDING, and SHOOTING! Mr Science (Sterling Cathman) is a specialist primary science teacher and has been working with kids and teachers for the past 10 years in schools around NZ. Don't forget to enrol in the Spring Playball Holiday Programme. We will be operating from Bayfield High School during the upcoming holidays 8am - 6 pm Daily. With specialised sports clinics delivered to children via our highly trained coaches, everyone is guaranteed to have lots of fun. In addition to this, we have Trip Days to Inflatable World, Laser Force, Bowling & Am I Fit. For the full schedule and more information head to http://playballdunedin.com/ or email: coachliam@playball.co.nz. Be QUICK as spaces are filling fast. WINZ Subsidies available. MAKE A MOVIE AT TOITU! With the Otago Settlers Association, Friends of Toitū Movie Competition. Who: Open to students aged 6-12 and 13-17. What: Bring along your device to make a movie at Toitū OSM and be in to win $200, plus one year’s membership to our Association! The Gas Works and the Steampunks are having a Family Fun Day on the 14th October at the Gasworks from 11am to 3pm. We will be making goggles, fob watches and crest badges. The Mosgiel Lions Club will be there for the sausage sizzle and we should have Amadeo- the science guy. Halloween will be celebrated at the Gasworks on Saturday 27th October from 5pm to 7.30pm. The Engine Room will become a Creepy Greenhouse. The Anderson Room will become a Fright Show! The Fitting Room will have Creepy Games and the Frightful Feast! Come along for a frightening time. Entrance fees will be minimal and all proceeds will go to the Gas Works. Kiwi schools and parents loved our first digital version of Tots to Teens, so we’re excited to send you the link to our next issue! In case you don’t know us, Tots to Teens magazine is a free community parenting resource for Kiwi families. We focus on positive, well-researched parenting advice to support children’s reading, learning, behaviour, nutrition, health, well-being, and resilience. We have distributed 550,000 free magazines nationwide each year to families through schools, preschools, libraries, and Plunket for over 16 years. To help support more New Zealand families, we are now producing Tots to Teens as a free digital magazine, using new technology that ensures an easy-to-read experience for parents, particularly for those parents who read emails using their phone. We want to make it easier for parents to read our helpful articles, and we’re doing this by making it simple to share the Tots to Teens digital magazine in your school newsletters and emails to parents. If this is your first time receiving the digital link, I’m contacting your school to ask you to take part in our schools programme to receive the latest issue of Tots to Teens as a digital magazine, which you can share with your school community. 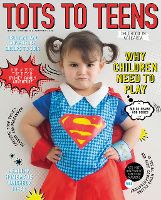 Parents can access the latest issue of Tots to Teens for free through this link. It’s easy to open and there are no big files to download, and it’s secure – parents can only access their digital copy of Tots to Teens magazine through this link via their local school. In this issue, we look at why “It’s okay to play”, as the brain’s right hemisphere develops by the age of four, and it takes about another three years for the left to catch up. We also have a parents’ guide on “How to check your child’s reading comprehension”, and we ask, are we suffering from “Digital defeat” – where social media and technology are killing our kids’ ability to read? “10 ways to become a remarkable parent” and “50 easy techniques to help kids calm down” will give you some great ideas. Make sure you’re in to “Win!” great prizes, and don’t forget to enjoy our “Family fun” page, too! We now have a fantastic new smartphone- and computer-friendly digital version of Tots to Teens for parents to view!